It’s Father’s Day on Sunday 17th June and it’s time to say thank you to your dad for all that he does for you. In my case, this involves looking after Caitlin and Ieuan, advising on important life skills such as cooking blueberry muffins and a whole heap of eye-rolling when I ignore his advice, despite the fact I’m 54 next week. Oh, and you can throw in retelling the most horrendously embarrassing stories about you at social gatherings. But that’s what dads do, isn’t it? At 78 he is showing no sign of slowing down and his memory of all my past transgressions is firmly intact. Dad hates any fuss and finds the whole present thing rather embarrassing so of course, we insist on getting him something nice and throwing a celebratory tea – which he always enjoys enormously! 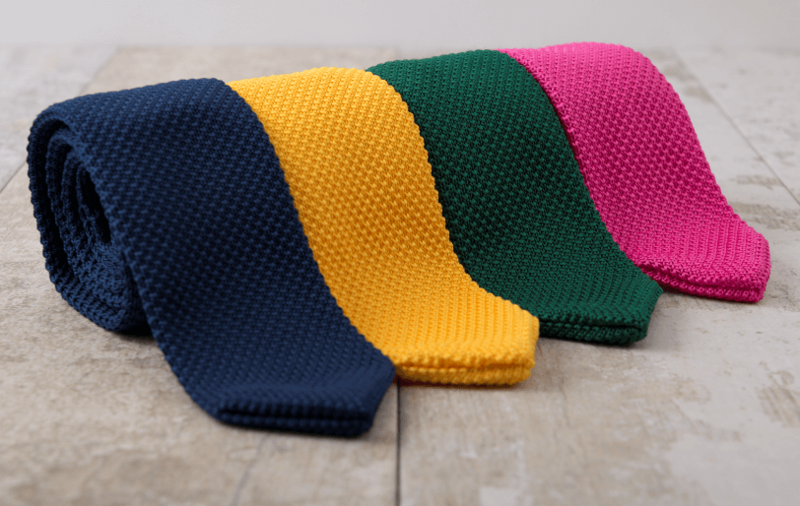 If you are wondering how to treat your dad this Father’s Day I have a fabulous giveaway for you – £100 to spend online at Frederick Thomas London who specialise in handmade ties, socks, cufflinks and other men’s fashion accessories. They have an extensive range of styles and trends suitable for anything from office attire to weddings and special occasions. You really can’t go wrong with a tie, can you? Dad still wears his to church on Sundays and you’ll never find him wearing anything drab. 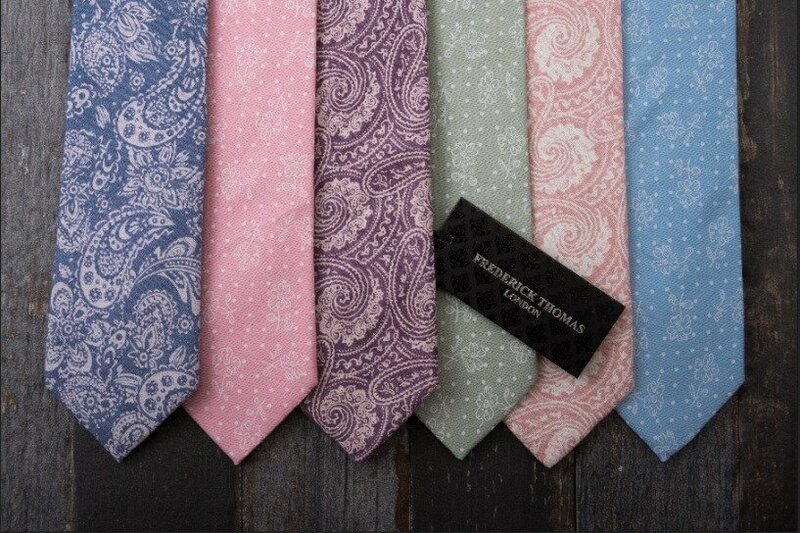 Father’s Day ties really don’t need to be boring. At Frederick Thomas London you can help jazz up your dad’s wardrobe with their fun dinosaur and skull print ties, or add a bit of texture with linen, knitted, tweed and wool ties. You’ll also find a great selection of cufflinks, pocket squares, socks and tie clips. As an extra special deal, Frederick Thomas London is also offering Mother Distracted readers a £10 voucher to spend at www.frederickthomas.co.uk. Just enter the code FATHERSDAY14 at the checkout. The competition is open to UK residents, and you must be over 18 years of age to enter. Entry is via the GLEAM widget and the winner will be selected at random from all entries received by the closing date on 13 June 2018 (11:59 pm). Any entries after this date will not be considered. There is no cash alternative and no change given if the prize amount is not spent. There will be ONE winner and the prize is as specified. £10 voucher code for all readers expires 18 June 2018 and cannot be applied to existing promotions. Please note, whilst every attempt will be made to deliver in time for Father’s Day, this cannot be guaranteed. It’s wonderful you have a close relationship with your father. I would choose a big bundle of socks for my Brother you can never have enough socks! I’d let my husband choose he would probably go for lots of socks as he’s never got enough and there’s always that sock thief ! Socks and ties for the hubby! I fancy the socks and probably would spend a good share on pairs like PINK MENS SOCKS WITH GIRAFFE DESIGN or MINT GREEN MENS SOCKS WITH LLAMA DESIGN. My husband wears a suit to work everyday, he loves cufflinks as it jazzes up the suit a wee bit, I would pick some new cufflinks for him. I especially like the pineapple cufflinks! They are cool! I would spend it on a few pairs of cufflins, or maybe put it towards the Hunter Green and Orange Check Tweed Weekend Bag. I would definitely buy the bicycle and the motorbike ties for my husband and socks for my boys and husband. I don’t have a man in my life anymore so would love to get some items to donate to charity, to go to Romania (socks would be good). I love the burgundy tie with the doctor who blue tardis design, so novel and unique! I would get the silver style penguin cufflinks and some jazzy socks for my Son-in-Law. I would probably put it towards one of the fabulous weekend bags. Either that or lots of great socks! BLACK SKINNY LINEN TIE is what I would get my OH for his brothers wedding later this year and some new socks. SILVER AND GREEN TURTLE CUFFLINKS looks great, my husband would love it! I like the dinosaur tie, but I love the penguin cufflinks even more, they are ace! id go for the pink pig cufflinks, some tie clips and nice new ties for my hubby!! I would put towards a black check tweed weekend bag and matching wash bag – Look lovely. I’d choose the navy blue skull tie – it’s classy but a bit rock and roll like him! Love thier funky socks, the PINK, ORANGE AND YELLOW CAMOUFLAGE MENS SOCKS are pretty funky! I would buy my dad some socks. He gets through so many! I love the socks so would buy lots for my husband and sons. I’d get my husband a supply of socks, especially the MEN’S STRIPED SOCKS WITH BLUE STAR DESIGN DESIGN! I think I would stock up on socks….My fella goes through so many! This would make such a great Fathers Day gift for my husband as he has just moved department at work and has lots of meetings and presentations so my daughter would love picking out a smart collection of ties for her daddy. A selection of ties, particularly the ones with animal prints,as my husband currently only owns 1 plain, boring, navy one. The navy tie with spitfire plane pattern, light blue tie with lancaster bomber pattern, black skulls design tie, navy tie with white spider silhouette design and navy tie with giraffe design. My dad is a plain tie kind of man so the plain lilac knitted tie would be great for him as it still has a bit of a different texture but he can’t complain about it being out there! Wow, they have some great things to choose from there. I would buy some things for my hubby and son, such as the NAVY TIE WITH DUCK DESIGN, NAVY BLUE TIE WITH T-REX DINOSAUR PRINT, NAVY TIE WITH ACOUSTIC GUITAR PRINT and the silver style chess piece cufflinks. I would buy lots of socks including the MINT GREEN MENS SOCKS WITH LLAMA DESIGN. This would be a gift, so it’s up to him to choose. Looking at the website, I’m more interested in the socks than the ties. I like colourful socks, and they have a good selection to choose from! Some new socks and a tie or two would be a great pressie for my dad! My husband never buys decent, good quality socks so I would spend the money on a selection of their socks. I would buy my husband a selection of socks and ties to wear to work as he has to look smart. I would choose an assortment of the funky geometric socks. They are so bright! My dad might be conservative on the outside but he has a hidden wild side! Animal ties for my friend Fiona’s wedding!! Specifically the green tie with trex dinosaur print!! I would choose some bright coloured socks for my husband! Definitely a gorgeous new tie for my boyfriend! I would buy a tie, some socks and a lovely tie-pin. I would love to buy my husband a trendy man bag for work but if i buy it he will return it and use the money for next weeks shopping lol….if I won a voucher towards it he would keep it and love it lol !! I would put the credit towards the very smart GREY TWEED WEEKEND BAG WITH WHITE STRIPES AND MATCHING WASH BAG. Possibly Letter N’ … Cuff links. I would honestly blow the whole lot on fancy socks! Too hard to choose, I’d let him. But, where do they all go?? I would put it towards buying the LIGHT BLUE WINDOWPANE TWEED WEEKEND BAG AND MATCHING WASH BAG because I think these look great for holidays. I LOVE THE LIGHT BLUE WINDOWPANE TWEED WEEKEND BAG AND MATCHING WASH BAG, PERFECT FOR WEEKEND GETAWAYS! they have some fabulous things, the first thing I would buy my pops though would have to be the rubber duck socks, they are so him! I’d use the £100 to buy him 5 ties – perfect for his new job. One for every day of the week! I would spend the money on some funky socks, as lots of mine have holes in! My favourites on the Frederick Thomas site are the giraffe socks, the blue and pink flamingo socks and the Scream socks. Great comp – thanks for running this. I would buy a collection of ties for my Dad. I think he would particularly like the beautiful navy ties which feature birds and animals including cheetahs, rabbits, stags, and swallows. He’d also love the navy tie with guitars on! I would buy sock, mine have holes in! I’d spend the voucher on my dad, definitely get him the T-rex navy blue tie! it’s fab! So in love with the dinosaur tie! I really like the lapel pins. I’d be tempted to get some of these, and some new cuff links. I would get a T Res Dinosaur tie amongst other things like socks. My Dad loves socks. he has a huge collection so I would love to give him some more and make this father’s day really special. I would buy the Navy tie with the acoustic guitar print. Awesome gifts by the way. I love the T Rex tie design which is really fun! I would get the hubby some cufflinks, a smart shirt and tie from the children for my best friends upcoming wedding! Some new cufflinks for my husband! He does love to wear what he calls proper shirts, but his cufflinks have definitely seen better days! I’d get the rubber duck socks definitely. I’d get more socks too but not sure on which ones yet because there’s so many nice ones!! Love the funky socks. Hubby definitely needs some new ones! I’d get my husband a variety of socks because he always needs new ones. I like the black check tweed weekend bag. I would treat my big brother to some socks and the Navy Blue T-Rex tie! He does so much for me, it’d be lovely to surprise him with some luxurious goodies! I’d probably get a few sets of cufflinks for my husband. I would let my son choose lots of socks for his dad. I would buy beautiful socks and lovely hand made ties. One of those tweed bags.